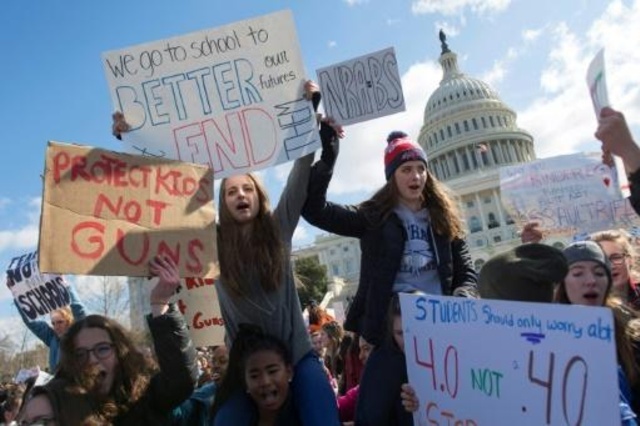 Hundreds of students across the nation faced punishments for participating in the national student walkout last week in support of increased gun control, according to published reports. There were even some students punished for not joining the protests. My entire adult life has been spent educating people in America to think American. During this time, I have experienced peaks and valleys of great hope and despair. I have experienced hope in the resilience and courage of youth to stand boldly against injustice. But I have some despair when I see their boldness being co-opted by a system of thinking designed to destroy and replace the moral fabric of our American Republic. Let me be clear, if you can isolate American youth to abandon their constitutional heritage and train them to replace the safety and security of their benevolent Creator with that of their Government, then you can enslave them—or rather—they will enslave themselves. Quotes from men like Thomas Jefferson who declared, “No free man shall ever be debarred the use of arms," are outright rejected for the feeble ignorance of arms control. Well, Alex, historically speaking, any people group that has been disbarred the use of firearms become slaves to thug governments. Declaration author Thomas Jefferson again made the accurate diagnosis that, "The two enemies of the people are criminals and government, so let us tie the second down with the chains of the Constitution so the second will not become the legalized version of the first." The Second Amendment has always been the reason for the defense of our God-given rights in case the government becomes the enemy of the people. The problem with Alex, and other students like him protesting gun rights, is their education consists of learning about a new, untried world of peace; where government control keeps us safe from everything. They pontificate about socialized happiness while they enjoy the protection of a Judeo-Christian system of ethics that has held back the ugly reality of secular, socialized despotism. In the Preamble to the Constitution, the Founders wrote to future generations that the purpose of this new government by the people and for the people was to “preserve the blessings of liberty to [themselves] and [their] posterity”. They left us a legacy where we have not labored. In conclusion, I believe the actions of these protestors are Constitutional; but the purpose for the protests, in words of Solomon, is vanity and a great evil.